How do you go from $20,000 /month selling done-for-you services to $400,000 /month selling an online training program? And in todays customer interview, Robb Bailey explains exactly how he did it in record time. 1. Where Robb started out before joining the program. 2. The problems Robb experienced as a Done for You service provider. 3. Robb’s earlier failures with programs and how he overcame the challenge. 4. How Robb learned how to solve his industries problems to help his customers. 5. The secret behind exponential growth. 6. Robb’s hiring and team building process. Do you want to get results like Robb? Robb's transition from $20,000 /month to $400,000 /month was made possible by joining the Consulting Accelerator training program. Sam Ovens:	Hey, everyone. It's Sam Ovens here, and today I've got Robb Bailey on with us. Robb's been a customer of mine for quite a while now, and I remember he joined Uplevel Consulting, which was a program I was selling back in 2016, in March then, and that point when he joined, he was helping local businesses with Facebook ads, and he was doing done-for-you, which means he was actually on the tools doing the actual service deliver and the advising for these local businesses. Sam Ovens:	At that point, he was making around $20,000 per month, and then he joined Uplevel and learned how to really move from done-for-you into leveraged group programs and online courses. 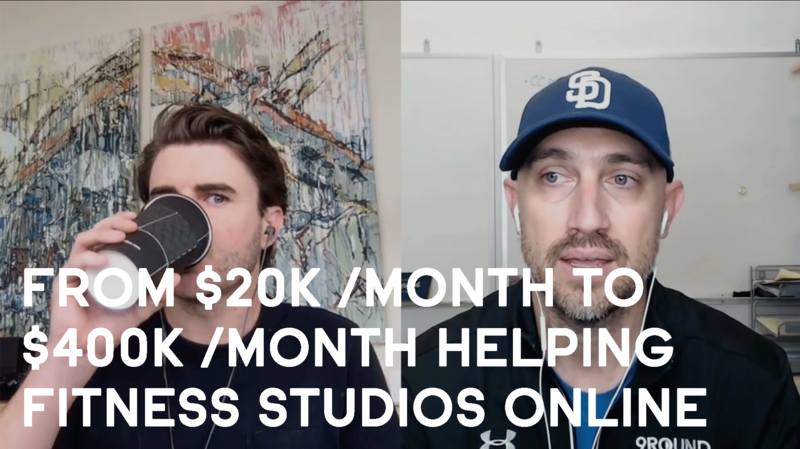 We also got him really niched down, and so now what Robb does is he helps fitness studios and he helps them get more customers online and he's been able to grow his business now to the point where it's making $400,000 per month. Sam Ovens:	You said you've made 402 grand this month, and it's May 31st right now. Robb Bailey:	Correct. Yeah. Sam Ovens:	Not including today's sales. Congrats on that. That's a huge jump. Robb Bailey:	Thank you. Yeah. It's been a wild ride, man. You've seen it. Sam Ovens:	So let's go back to the start. In March 2016, what was going on in your life and in your business back then? Robb Bailey:	Yeah, good question. At that time, I'd actually shut down a much larger agency. I call it my seven-figure failure agency, because I had a huge office in downtown San Diego with a bunch of employees and a business partner, and we did everything for everybody. We had some big corporate clients. Our website was kind of funny to be now because the menu was just nonexistent it was so big. I mean we could literally do just about anything for anybody. Robb Bailey:	After three years of grinding that out, my partner and I were done, so we shut that thing down. In 2016, I was really trying to get a fresh start. I went back to the drawing board and decided to do Facebook ads for local businesses. That's always where my passion has been is helping local businesses, so I decided just to specialize in just doing Facebook ads and lead generation to productize my service, essentially. Sam Ovens:	Got it. At that point where you were doing Facebook ads for local businesses, making 20K a month, what problems were you coming up against? Because typically enroll in programs because they're trying to break through a glass ceiling or get to a new level or they're trying to solve a problem. What were the problems you were facing then? Robb Bailey:	Yeah, so the problems that I had were typical problems. It was actually interesting because this was before or right when all these Facebook ad agency courses were coming out, and so if you could get good results with Facebook ads, it was pretty easy to get clients then because there just weren't that many people out there who were proficient at it, I guess. Robb Bailey:	But the problem that I was facing particularly was a symptom of before where I hadn't niched down, and so every client was different. I had no systems and processes. I could get them results, but it was 100% on me. There was nobody else in the business who could do what I did or was doing, to be honest, I wanted to help more people. Robb Bailey:	I wanted to do two things, actually. I wanted to help more people, and I wanted to earn enough to where my wife could quit her job if she wanted to. We've got three small kids at home, and so that was on the horizon because I knew that that was unsustainable as well. Her working all the time and me working all the time, having three small kids, to me, I just didn't want to raise my kids that way having mom and dad gone a lot. Robb Bailey:	So I knew I had to replace her income at some point. I didn't know when, but I knew that, especially if I got injured or sick or we had another baby and I wanted to be around with the baby, there was just nobody doing anything inside my business. I was basically self-employed. I just saw the writing on the wall, and I wanted to build something bigger that operated without me. Sam Ovens:	Got it. I think in the financial world they call it key man risk. Robb Bailey:	Yeah. In fact, my wife's boss told me I should get what's called key man insurance in case something bad happened to me, and I was like, "Well, that doesn't make me feel any better." Yeah, I think that is a thing. They call it key man insurance. It's crazy. Sam Ovens:	I understand the problems. Then how did you come across me and Uplevel? Robb Bailey:	It's funny. I just reconnected with Sean Vosler, but Sean was helping you with some stuff, and he's also here in San Diego where I live, and he made an organic Facebook post and just said, "Hey, if you're not following Sam Ovens' stuff, you should definitely check it out." Robb Bailey:	I started checking out your videos. Again, keep in mind this is before the current videos, so these ones were very pre-popular Sam, I would say, but still super authentic, and I really liked what you were saying because you were talking about your failures and what you'd learned just as much as your successes. So after a couple months of seeing that stuff, I finally booked a call with you. Sam Ovens:	What do you mean by pre-popular Sam? Robb Bailey:	I mean, to you, you might think that ... From my perspective at least, nobody that I knew knew who you were, not a single person out there, and I think that's why Sean made that post because I don't think too many people knew who you were in most internet marketing communities. Robb Bailey:	I mean I've been helping people with internet marketing since 2005, and I didn't [inaudible 00:06:32] about you, and now, if you ask the average person in our community who you are, they at least know your name, and chances are they've seen a lot of your content, so in yeah, just two short years, look how fast that's happened, I guess. Sam Ovens:	I guess it's more a function of six million in ad spend in two years. Robb Bailey:	There you go. Sam Ovens:	So you found out through me through Sean, and then what interested you in Uplevel? Robb Bailey:	To be honest, I knew nothing about it, but I got on the phone with you and I was telling you what I was doing and where I wanted to go. I remember you just saying it really bluntly. You're like, "Look, man. If you've already gotten that far, I can help you get to six figures a month, no problem. All you got to do is put in the work." I told you, "I'm not afraid of putting in the work." Robb Bailey:	Obviously, we had a whole conversation about my business and where we wanted to go and everything, and you took the time to ask me questions and figure out what my needs were from the business, but at the end of that, I just really clearly remember you having that much confidence that you could help me with it, and you told me some stories of other people who looked just like me who had hit that goal all in a short period of time. Robb Bailey:	You also asked me why I couldn't do it on my own, and I said, "I don't know how. I've never done this before." I didn't know anybody else who had done what I wanted to do through a program like yours. It was unique, and you had that confidence level. I remember I told you, I'm like, "I don't know. I got to think about it," and you hung up. You had another strategy session to go to, and I had to email you that night and be like, "Dude, where's the PayPal link? I want to do it." Robb Bailey:	I don't think you thought that I was going to sign up, but you just shot the link with nothing. There was no text or anything else. It was just the link to the PayPal button, and this was back when you were doing a lot of strategy sessions every day, but I just paid. I think I even had to wait a day or two to get into the training because you were that busy, but [crosstalk 00:08:47] Sam Ovens:	Nothing was automated back then. That's all- Robb Bailey:	Nothing. No. Sam Ovens:	Human being behind everything pulling all the levers. Robb Bailey:	Yeah, and you had told me that. You're like, "I have to literally hang up and dial another number now, so let me know what you want to do." That really sunk in because you were actually back-to-back eight to 10 hours a day with calls, and I was thinking about where I was at, and I was lucky to get one new prospect per week or per month at that point. I was just like, "I don't know what I'm going to do." Robb Bailey:	So that was really interesting to me actually because it was just you, and you'd built that to something like crazy, 300 grand a month with one guy, just on the phones all day. Then your students were still getting good results so yeah, that was a big mind shift for me, and the big risk- Sam Ovens:	What did you have reservations about? What made you think, "Oh, I need to think about it"? Robb Bailey:	Well, number one, I'd never invested that much with anyone before, I don't think, or if I did it was certainly spread out over time. It was a big investment for me, but I also didn't know what I didn't know at the time, and at the time my mindset was that, "Well, I'm not Sam. I don't have all this cool stuff. I don't have the experience that he's had building all these technology businesses and stuff like that." Robb Bailey:	So I just didn't know if I could do it, to be honest, because I'd just failed, and that wound was still open, and rightfully so, my wife was a little bit gun-shy. She's like, "Well, you're going to go and take another swing in the batter's box again?" I wanted to do it, but I was scared to do it. That's really what it was, but to me it's like I would rather fail fast and figure it out fast then drag it out for another three years and be miserable like I was before. Robb Bailey:	So I was like, "Let's rip the Band-Aid off, see how this goes, and if I fail in a month or two and I hate it and I'm not good at it, then I can just stop and figure out whatever's next, go get a job or whatever," but I was like, "Let's just get this done because I got kids. I can't afford to be dragging this out for another three years not taking home any money." That was my mindset at the time, I suppose. Sam Ovens:	It's funny, right, because back on a sales call like that, if I say something like, "Dude, if you can get to 20 grand a month, I know you can get to 100," and I would have believed that. Isn't it funny how you might think, "Oh, but I might not be able to do it," and then you've got to think about it, and then imagine if you didn't make that decision to join. It's scary sometimes, right? Robb Bailey:	Really scary because, we could talk about this a little more too, but my mindset continued to expand over time. I used to think, "Oh, if I could just get to 100 grand a month," and then we hit 100 grand a month, and I'm like, "Oh, if I could just get to 250 a month." Then we hit that, and then, "Oh, 400 a month would be incredible. There's no way we can hit that, right?" Yes, we can. Robb Bailey:	The fact that there's no one else really teaching it the way that you do it tells me a lot because the mind game of this is so important. I very highly underestimated initially how strong and how important the mind game is in this type of business. Robb Bailey:	I had no coaches when I failed. I had no mentors, nobody to help me and guide the way, and so I was just doing things like everybody else around me was doing, and therefore my agency looked like all of the other agencies that I knew of. I mean we were all doing the same stuff. There was nothing different about us. Robb Bailey:	In fact, I know a lot of people who are still doing that business model, and that's fine. They seem happy. If they're happy, I'm happy. Nothing wrong with that, but for me, I had always wanted to have more impact and also provide for my family more, and with that model, I didn't know how to fix it, but I knew that I didn't want to do it that way anymore. In other words, I'd rather go back to a job then do the model that I knew didn't work that I was unhappy in. Sam Ovens:	Yeah, just recently I started calling agencies sweatshops. Robb Bailey:	Sweatshops. Yeah. Sam Ovens:	Because they kind of are. Robb Bailey:	They kind of are. Yeah. Even if you fix a lot of the problems, even if you create value-based pricing and all that stuff, you're still trading time for money at the end of the day. You can only get so much leverage with that model, and if you scale up and hire a bunch of people and get all of this overhead, like I did, the margins just disappear. I mean it's really tough to make a decent margin with that model once you scale. Robb Bailey:	So really, it's like you stay the one-man sweatshop and take home some money, but it's all on you, or you grow and scale and the margin disappears, and then you're basically just running a bigger sweatshop. Yeah, I like that analogy. That's pretty accurate. Sam Ovens:	I think it all comes down to the complexity. That's it. It's just too complex to just run effectively, you know what I mean? There's always so much waste. Robb Bailey:	Yeah, and the thing that I found out was I have good chops. I would certainly hope that I have good chops after 13 years of doing this full-time. The proficiency is there, but it was so difficult for me to teach all the other people on my agency the skill set that I had because it's really hard to find somebody who's got all the experience that I had, and if you do happen to find them, they're a bit like a unicorn. Robb Bailey:	I mean you really have to throw the books at them. You have to give them a good package to bribe them to come over, and even then, it's like at that point they may as well own their own business if they're that good. That was the landscape that I was looking at, and I felt myself just going around in circles. I was like, "Can't do it." Sam Ovens:	Got it. Robb Bailey:	I was looking for something better. Yeah. Sam Ovens:	Then you joined Uplevel, and then what happened next? Robb Bailey:	So I'm a slow learner. I was not getting into the rocket ship and blasting off to the moon right away, but one thing is that I don't give up, or at least that easily. So I actually failed a couple times with my first programs because I didn't know what I was doing, and I figured out that I had to become even more proficient than I was. What I ended up doing was after I had niched down, I decided that, "Well, there's no real value to me just continuing to do what I was doing," because at this point, by the time I had jumped into Uplevel, more and more people were starting to enter the marketplace and offer Facebook ads as a service. Robb Bailey:	The seas were becoming a bit bloody, if that makes sense. I was still proficient, but what I was finding was that all of my clients were not good at following up with the leads, and they were not good at closing the leads. I mean there might be one out of 20 that was decent at it, and again, finding somebody who was super good at it, it was like unicorn status. Robb Bailey:	So ironically enough at the gym that I go to down the street here, the guy who sold me my membership is a gym memberships sales expert, and so he and I were working together on them as a client. They had hired me, and I was getting such good results with them because, number one, I was running the ads. I was doing the account myself, and then number two, he was following up and closing them, and this guy was knocking it out of the park. Robb Bailey:	I mean everything I would send his way, he would close pretty much. He was closing about 80% of the people that would come in from cold traffic, and most of my clients were, at best, closing 10, 20%. I pulled him aside and said, "Hey, man. What are you doing to do this?" Robb Bailey:	So he showed me the whole system, and let's see. That was in June or July of 2016. So I really started to pull that whole thing apart and paid him for some of his time to show me everything, the ins and outs, and I began teaching it to the clients. That was my first program where it was like, "Okay, this is a bit of a hybrid. I am doing the ads for you, but now I've got these two other pieces that are so critical to you getting what you really want, Mr. Gym Owner, which is more memberships, and this program covers everything you need from soup to nuts so that you can do that." Robb Bailey:	So that was the infancy. I mean at the time I felt like, "Oh, I found it. This is so great. It's so big. It's going to be huge," but looking back, it was like a grain of sand compared to how far we've come now, and so long story short, I ended up inviting him to be my business partner after we had worked together for about a year, and now he's my business partner, and he helps with those two areas, the lead follow-up system and the sales training. So we- Sam Ovens:	This is good. This is good, this piece here. Rewind a little bit. You said you picked some wrong niches, and then somehow you ended up on the fitness one. Tell me how you picked fitness, because before you were doing just generalist, local businesses. How did you pick that? Robb Bailey:	I've got a friend who specializes in the fitness niche. He runs a Facebook ads agency for fitness businesses, and he was crushing it. I called him up one day and took him to lunch, and I said, "Hey, man, I'm really struggling with picking a niche." I had tried to focus on the real estate niche before that, and I couldn't do it. The niche was not a good fit for me and my personality style, and I didn't like the type of clients I was attracting. Robb Bailey:	I basically said, "Look, man. I hated working in real estate. I just don't want to double down on that because I just don't think it's a good long-term fit, and I'm wondering what niche you think might be a good niche for me to enter into?" I used to play sports and stuff, so I have a natural interest in athletics, but he was like, "Dude, do you know how big the fitness niche is in the US?" He told me how big it is, and I had no idea. Robb Bailey:	I mean it's in the billions per year in the US, and there's just no one big player that owns a ton of the market share. So it's a very segmented space, meaning there's lots of little slices of the pie. He's like, "You could pick one sub niche in the fitness industry and never serve them all in your lifetime. That's how big this industry is." Robb Bailey:	So I'm like, "So, are you saying that I should become your competitor?" He's like, "There is no competition in fitness. It's that big. You could enter and crush it, and it wouldn't affect me at all, man. That's how big it is," and he was right. He helped me carve that path, and he showed me what he was doing, and I liked it a lot. I like upbeat, positive outlook type of people. I like working with people who get up every day and they want to make an impact in the world, and that's what most gym owners do. Robb Bailey:	Most of them don't do it for the money. Most of them do it because they want to help people and they want to have an impact. That gets me out of bed when things get hard. It inspires me to see my clients go and like, "Yeah, I just closed four more people in our program, and we're going to help them change their lives." That last bit is really important to me. That's how I chose the niche, and once I got into it, I instantly loved it. It was like no-brainer, this is what I want to do, and that's how I got started. Sam Ovens:	So you found the thing you loved, which is always important because that unlocks about 1,000% more drive as soon as you get it, you know what I mean? It's like you become all of the sudden really driven, really obsessed, really focused. It's like ... Robb Bailey:	Yeah, and now it's funny because people say things like, "Oh, hey, how was your weekend? It's Monday. I know. Ugh." I'm like jacked to come into work on Monday. I'm like, "The weekend couldn't have stopped fast enough," and on Friday I'm like, "Oh, can I keep working tomorrow?" That's how I know internally that I'm just jacked out of my mind because it doesn't seem like work, and even the bad days, I'm like, "That was not a bad day." It doesn't seem like anything but what I want to do anymore, which is vastly different than how it felt before. So yeah, I think you're right. It's like a video game. There's hidden powers that you unlock when you find your passion. Sam Ovens:	Then once you picked that niche, you started helping them just with the ad side, right? Robb Bailey:	Yeah. Sam Ovens:	You said the problem that they had was they'd do the ads, but then they'd drop the ball on the other side, like the operational side and the sales side, which meant that the overall system failed, not because of the component you taught but the components that you didn't teach. Robb Bailey:	Right. Sam Ovens:	It seems like at this stage you started to do your first thinking on your own, independent thinking, like, "Hey, instead of just following what everyone else is doing because in this space I'm kind of pioneering now. I see these problems, and I trust myself to fix these things and put them into my program and trust my own judgment. I don't need to look at what other people are doing anymore." Robb Bailey:	Right. In fact, the idea that I had was to basically create a franchise-level sales and marketing system because nothing out there really existed like that. When I looked at ... and this is a credit to you. I mean you're obsessed with your product. You're always making it better, and I looked at our product, and I'm like, "Well, there's nothing unique about it. I mean, if we're just going to do Facebook ads and tell clients that they're not closing the leads, that's what everybody else is saying." Robb Bailey:	Going into your favorite lead generation Facebook group and complaining that your client isn't closing the leads isn't doing anything for your business, and it's certainly not helping the client, and although it's not our responsibility directly, I definitely wanted to have a bigger impact. I said, "Well, let me see if I can help solve that problem too." Robb Bailey:	Then once I figured it out, it was actually fairly simple to solve. It's not a super difficult thing to solve, like inventing the iPhone or the computer or something. It wasn't a problem like that. It just took extra effort and actually giving a crap, and going- Sam Ovens:	And independent thinking. Robb Bailey:	And independent thinking. Yes. Yeah. Sam Ovens:	How much money were you making before that switch? When you were selling a program to ... because at this time you had switched from done-for-you to program, and you had switched from generalist local businesses to fitness industry. How much were you making per month then? Robb Bailey:	It was about 40 to 50,000 a month. Sam Ovens:	So you were able to get up. You were able to double from those two movements, but you still didn't have that exponential curve yet, which makes sense because you'd made incremental improvements. You'd niched, which is good, but niching doesn't radicalize something. Then you were doing a program, which unlocks a bit of scaling potential instead of done-for-you, but then what happened? Sam Ovens:	First of all, there's two parts I want to cover here. You started to look at the problems, and instead of complaining and bitching about the problems, which is what most of the market does, you thought, "What if we fixed them?" And that question there is probably what unlocked everything, and then to try and fix them, you identified the person in the industry who had fixed them, and then you went to him and learned from him instead of trying to do it all on your own, which is very smart. Robb Bailey:	Thank you. Sam Ovens:	So when you went to him, what did you say to him to let him just open up and share everything? Robb Bailey:	Well, he loved me because he was the membership director, and the guy that owned the gym was like, "That's your jam. Just grow our memberships." He had to lobby to this guy and say, "Hey, I don't have time to learn Facebook ads myself. Can we just hire Robb to get us this result? He'll set them up, and I'll knock them down." Robb Bailey:	He was a fan of me because I was getting him good results. He had tried a couple other companies before, and they didn't get him very good results at all. I would go in to work out, and I'd just drop by his desk, and go, "Hey, how's it going?" He's like, "Awesome," and he turned his screen around and showed me his numbers and stuff, and I'm like, [inaudible 00:26:33], and so we became friends fast because I would see him frequently and we would chat about business. Robb Bailey:	This guy is not the normal employee. He wanted to be an entrepreneur. He's a younger guy, and he had been doing gym sales for about 10 years. He'd closed over 6,000 gym memberships, so he's very proficient, but he was hitting his cap, and he had done it for so long he wanted to have more impact. He was only really helping one location's worth of people, and he's a very driven guy. We became friends fast, and I was like, "Hey, I don't want to take advantage of you. Let me pay you for you to teach me what you're doing so I can put it in my program." Robb Bailey:	That was I think around the time that I signed up in your Mastermind, which was December 2016, and so for about a month I paid him to help me create the content for this part of my program, but only about a month later he had called me and said, "Hey, I'm going to quit that place, and I just want to know what you're doing." I said, "Hey, let's go have a coffee. Let's talk. I want to snag you up if I can and put you in this program," because he is so proficient at it that it was just a skill set that I couldn't master. Even if I have tried to do it at the same level as him, I just would never be able to do that as well as he could. Robb Bailey:	So he had taught me this system, but there was little nuances that I wasn't sure about and that I would have to figure out through trial and error. So essentially, I said, "Well, why don't we work together on a short-term trial basis, and I'll have you cover those two areas, and I'll cover my area, and I'll put the program together. I know how to do all that. I've got Sam's program. I know how to structure it. I'll handle those two parts. You handle those other two, and let's see where it goes." Robb Bailey:	Once we started doing that, I mean it was like an exponential effect because all he had to do was get on the phone with somebody or get on a video call like this and teach it live, and I would just be in the background recording that, and that was our first iteration of the training. So he just had to show up and do what he normally does, and we started off teaching at 101, but we recorded everything, and that was our first version of our real program, if that makes sense. Sam Ovens:	Got it. Yeah, I love it when I see stuff like this because a lot of the time people think that scaling comes from spending more on ads or working harder or doing some different things and it does but only linear scale, never exponential, and that's how you're able to double and that's how you can probably double again, but it's all linear. Sam Ovens:	The key to exponential stuff, when it just goes bam, is innovation, and that's what you really did. So really the people who are trying to think, "Oh, what's the secret behind Robb's thing," it's independent thinking and innovation. Looking further downstream, what happens to these leads after we generate them? Then they go to the sales team, and then further downstream again what happens after the sales team sells them? Do they like the gym? Do they stay? Then what happens further down the stream? Most people just fixate on their little piece and forget about the rest and say, "It's your fault or your responsibility," but you looked down there. Robb Bailey:	We did. What we ended up doing was white labeling a lead nurturing system, and so we're basically part of our program now is a piece of technology that semi automates a lot of the middle part. As soon as a lead is generated, our text messaging platform will open up a two-way text with the person and it will respond to them to keep them warm until the gym owner can get on the phone with them. Robb Bailey:	That part of it was massive as well. It was one thing to ask them to do it manually, but again, once we started teaching this to a certain amount of people, we're like, "Well, they just can't get to the phone fast enough when a lead comes in, so what can we do to solve that?" Now we have this proprietary platform too, and that's the thing that has become a bit of the innovation. Robb Bailey:	It's still in its infancy stages, so it's a few pieces of text put together, but eventually we're going to create our own custom thing because that's where the innovation lies. I mean at that point we'll have the best product in the marketplace, and no one will be able to really compete with us on that level. Sam Ovens:	That's when you know your program and teachings are getting good when the level of your [inaudible 00:31:23] your own damn tools because we're ahead of where the whole market is for tools. Robb Bailey:	Yeah. It's really interesting because there's these giant systems out there, the big CRMs in the fitness industry, and they're like dinosaurs because they're so massive, and then there's these really small, flexible tools like things like everybody in your program probably already knows about, like ClickFunnels and Zapier and things like that, but those things are only good enough to piece together. Robb Bailey:	So there's that middle sweet spot where we're lying where we're like, "Well, if we can just create something that's everything you need but nothing you don't and make it good it useful just for gyms, then it's a no-brainer for these folks because it solves so many of their problems." It's like plugging the leaky bucket with all your fingers at once. It holds the water so much better right away, just immediate, instant results. Sam Ovens:	Got it. Then what happened after you made this first big innovation by bringing this other guy in and getting him to teach his piece there? What happened to your business in terms of sales and all of that? Robb Bailey:	So we started having regular 50 to I would say $80,000 months after that, and really it was just him and I and my campaign manager at that point. The next ceiling that we hit was just our time. We were working on the program and getting more leverage through creating the trainings and the program and stuff, but we really needed to start building a team. We really wanted to scale, and so I would say we spent the first half of last year just building a team and figuring out how to scale this thing. Sam Ovens:	How did you know you needed a team? What things started to break? What were the cruxes in the business that made you know that? Robb Bailey:	Yeah, good question. Mostly it was that when a client got onboarded, there were people falling through the cracks, so to speak. In other words, some people were not being served fast enough. Other- Sam Ovens:	What does served mean? Robb Bailey:	Served means they weren't onboarded quickly enough to get them results fast enough. Sam Ovens:	What do you have to do to onboard them? Robb Bailey:	A lot of times we just need to ask them what they're saying in the gym. The first thing we do is we train them. We help them brush up on their sales skills, and the reason for that is because as soon as they change what they're doing, the next person that walks in, they can start getting results from then forward. Sometimes our clients would skip that step because they thought they didn't need it, things like that, and so we would turn the ads on, and they'd be like, "This doesn't work. The leads stink." Robb Bailey:	We're like, "Well, what are you saying to them?" They're like, "Oh, the same stuff I was saying." "Oh, so you skipped step one?" "Yeah, I skipped step one. I don't need it." "Were you still closing- Sam Ovens:	Oh, so you were doing the ads for them still? Robb Bailey:	Huh? Sam Ovens:	Were you doing the ads for them? Robb Bailey:	Yes. Sam Ovens:	Or you're telling them how to do the ads? Robb Bailey:	Yes. We were still doing the ads for them at that point. Sam Ovens:	Okay. That explains it. Yeah, man, wherever you do it, then they're lazy, but when they have to do it and they set it up, they know that that part's missing, and that's why they always do it. Robb Bailey:	Definitely. Yeah, and that was a hard lesson to learn, but we didn't quite have ... I want to phrase this properly because we love our clients, but a lot of our clients are technology challenged, to put it that way, and so it took us a long time to make the training fit the average client coming into the system to get them to do the ads comfortably. We had to go through several iterations of that and testing the teachings of it to get good results. Robb Bailey:	Some of our clients don't know how to use the internet really. Some of them do. That's not most of them, but some of them are tech whizzes. They're like, "I got it. Bye," but other ones of them are like Baby Boomer age, and they're not great with technology, plain and simple. That was an adjustment we weren't prepared for initially. We kept doing the ads just to keep our side of the bargain going and to keep our reputation and our results going for our clients. Sam Ovens:	Have you released that so far? Robb Bailey:	Yeah. Sam Ovens:	Yeah, good. Because that would have been the bottleneck, right? Robb Bailey:	Totally. Yeah, we couldn't have done $400,000 in sales and fulfilled on done-for-you with the size of our team. There's no way. Sam Ovens:	When did that max out? What revenue level per month? Robb Bailey:	I would say probably in January of this year we broke six figures. We did 117 grand in January, and we were feeling the pain big time, and that's when I said, "Okay, we have to figure this out now because we can't do that again." I [inaudible 00:36:29] and so yeah, in January we really said, "Okay, we're not going to do anymore done-for-you services," and we still had to dip back in from time to time. Again, just to keep the level of our service at the quality level that I wanted, but for the most part, when people come into our program, we're like, "You're going to do the ads yourself. Here's the training but go through the sales training first." Robb Bailey:	What's really interesting is as soon as we let that crutch go without even having to turn the ads on, so it took all the focus away from our done-for-you stuff, and it forced them to focus on the thing that was most important that we wanted them to focus on, which was the sales and the lead nurturing. Those two things, they can not turn ads on, and some of our clients would have a life-changing turnaround in just a matter of weeks. That was really interesting. As soon as we said, "Hey, we're not doing anything. You just have to get in there and do the work," I mean it solved almost everything. It was nuts. Sam Ovens:	Yeah, it's interesting, because what people really love but what we tend to think that they don't love is self-service. People love being unleashed and having the ability to do everything themself without asking any questions and without having to wait on other people and have phone calls and all of this crap, right? Robb Bailey:	Yeah. Sam Ovens:	It all really started back, like even supermarkets, they used to have a counter all the way around, and no customer could teach any of the things. They had to ask a clerk person to pack their bag and walk around, and then the Walmarts and stuff came out, and they had self-service. Now that's translated over into ... What's a perfect example? Amazon Web Services or something where you can spin up service, scale, do all of the stuff which you used to have to sign contracts and have face-to-face meetings. Now anyone can just do it clicking on a dashboard, and people actually love that. Sam Ovens:	They don't like being restricted to have a onboarding call with you, which might slow things down three days until you've got time. Then after that, your team's got to set up the ads, do this. That's going to take weeks. They want to just be able to go d-d-d-d-d-d, just do it all themselves, but we tend to believe we have to hold their hand too much, you know what I mean? Robb Bailey:	Yeah. I mean we still provide service. What we ended up doing is we just have open office hours now. My team will just be like, "Move as fast as you want, and we're here when you have a question." I think that was a Geico ad or something, "Technology when you need it, people when you don't." Something like that. It was some kind of catch phrase there, but that's what we're doing is the people who want to speed through love it because they're like, "Get out of my way. I want to go on my own," and then the people that need a little extra help, we're still there for them. That was life-changing for us, man. I mean incredible, incredible breakthrough doing that change. Sam Ovens:	We'll just get this timeline clear for people listening. You started at 20 grand a month doing generalist, done-for-you for local businesses, and then you niched to fitness, and then you went from done-for-you to a program, and that got you to 40 grand a month, or 40, 50. Then you started thinking for yourself, innovating. You found this other guy who had the missing piece. You brought him in, but you're still doing the Facebook ads component yourself. You got to 100 grand. Then you started to feel the pain. Then you put the Facebook ads on to them, and you put all the work on to them, and that's when it really got its biggest jump so far. Robb Bailey:	Yep. In January, we did 117K, and then I actually slowed things down a little bit because I knew we had to nail that part, letting go of all of the done-for-you. I slowed things down for a couple months while we fixed that, and then in April, we did 244, and then in May ... This is May now. It's the last day of May. We just broke 400 grand yesterday. So that's when I really knew. Robb Bailey:	I mean you talk about the flywheel effect. That's when we really knew that we could put as many people as wanted to be served into our program and it would only get better with more people, not worse. It's almost contagious at this point. Our Facebook group full of our clients, it's just on fire. There's just people in there posting results every day, people cheering each other on. We've passed that critical mass moment, but we wouldn't have been able to do that unless we had just let go of the done-for-you stuff. There wouldn't have been enough people to hit a critical mass in there. Sam Ovens:	It's never just the innovation that enables it because just innovation alone won't do it. You still have to do more calls, run more ads. You have to do more volume. So what did you do in-between the 100K a month mark to the 250 then to the 400 that really enabled you to process that much volume and close that many sales? Robb Bailey:	Good question. My business partner, Ryan, has been selling his booty off, but what we started doing was getting better with the messaging. Gyms are a big space, so if you just say gyms, it's not very specific. What we started doing was two things. We hired more people. There's a couple of key roles where we need customer support and things like that. I just went ahead and said, "Hey, I'm willing to invest in more people now because I don't want to be trying to hire somebody when we have a record month and be trying to play catch up and throw them in to a mess. Our processes and systems, we're going to have to put more people in." So, I proactively was hiring one person at a time. Sam Ovens:	Who were you hiring first? Who were your first few hires? Robb Bailey:	We had had a campaign manager for the Facebook ad stuff, but we hired someone we called client concierge. Her entire job is just to make sure people find what they need in our program and get questions answered in the Facebook group. Then we've also got a technology integration girl. Jess answers all the questions about Zapier and ClickFunnels and our text messaging system and all that stuff. Robb Bailey:	It's more like support people, so people answering support tickets, help docs, Facebook ads, questions, splitting up our live call recordings and turning those into docs in our Help Scout knowledge base so that people can find answers quicker. All stuff like that, really. Then my business partner, Ryan, would be selling, and I'd be generating the leads for our agency, working on the marketing stuff. Sam Ovens:	I guess that was a key component, right, because not only did you get his knowledge to make the program better and help the gyms get more results, but then you turned him on to selling your thing now, which- Robb Bailey:	Yeah, so we actually ... We took your script, and I was like, "I don't want you to change anything. Do not say anything different. Just follow Sam's script," because that's what I was doing, and I was doing okay with it, but he modified it based on his expertise in the gym industry and made a slight variation. We basically made it all our own, and to start off, I was sitting next to him on all the sales calls, and I would just listen and go, Whoa, whoa, whoa, whoa. Why did we say that," or he was saying, "Look. I need to add this so that I can prevent bad fits from coming into our program." Robb Bailey:	So we tweaked that thing over months and months and months together sitting next to each other, and now it's basically like anybody could read that thing and it would work. I mean we've got it refined down to that level. Yeah, it took a while, but now he's so dangerous. There's days where he closes everybody that he talks to, but that's two-fold. It's that we've gotten better at refining our messaging in the marketplace and attracting perfect fit people into our program, and then he's using the proven script to get them feeling like we can solve that issue for them and [crosstalk 00:45:19] Sam Ovens:	It sounds like he's an owner now too, instead of just a- Robb Bailey:	He is, yeah. Sam Ovens:	That motivates the hell out of people. Robb Bailey:	Oh, yeah. We did a six-month trial period together, and it went so well that I thought it was ... People told me all different kinds of things, but I was like, "With him plus me, this thing gets exponentially better. With each of us on our own, we can only help so many people." We both have that same vision for helping lots of people and making a big impact, and you're right, as soon as he became ... I mean he was driven anyway, but as soon as we formalized our partnership, it was just like everything was just on fire, it was just like, "Go, go, go." Sam Ovens:	In the first ever letter to shareholders from Amazon, Jeff Bezos ... I think it's 1997. He says, "we need a team that will think and act like owners. Therefore, they must actually be an owner." Robb Bailey:	Ooh. Sam Ovens:	Because the only way to make people think and act like them, you can't do smoke and mirrors and tricks. It's just make them a damn owner. Then everything else happens. That's part of the reason why Amazon has 600,000 staff that all work 12 hours a day, six days a week, and care more because they have 600,000 owners. Imagine that. Robb Bailey:	Yeah, and that's the culture that we've bred in our business too is everybody ... When we have a record month, I share in that success with our team. I don't know if that's what you're supposed to do, but everybody has autonomy, everybody has responsibility. We treat them like part owners, even though they're not formally owners, but I think that's a really important team building lesson as well is I don't babysit my team. I just tell them, "Look. You have lots of freedom, but you have to use that freedom responsibly and get your stuff done." Robb Bailey:	The culture in our business is that we're results first. If we're not getting results for people, then it's time to put more time in or get help and ask a question or something like that. So yeah, I agree that the ownership mentality is huge and we don't have a position where somebody can afford to slack. It just doesn't exist. We're too small to have anybody who's not an A player on our team, and maybe that's the principle behind it. That's good insight, Sam. Never thought about it that way. Sam Ovens:	You read those letters to shareholders? Robb Bailey:	I read the one that you shared most recently, but I haven't read the other ones. Sam Ovens:	Do. I'll be the best thing you ever read in your whole life, seriously. I've read a lot of books. That's the best information I've ever read. I mean it's a story, step by step, which you know is factual because he had to release each one of those at each point in time, so he didn't write it in hindsight and make his story sound good. He literally goes from being a small business where he was driving the pickup truck and delivering packages at the post shop to being the largest company and the wealthiest man in the world. I mean it's the best story ever because it's fact checked and it's done across time, and he's just extremely good at writing, and his principles and thinking is so clear. Robb Bailey:	Is it a book? It's just one- Sam Ovens:	No, no. It's just letter to shareholders. You can just Google it. Robb Bailey:	Just Google it. Wow. Sam Ovens:	Yeah, and you can find it one PDF. Each year is only three or four pages, so it's not a ton. Robb Bailey:	I'll check it out. Sam Ovens:	Now, we'll go back to your story like how you were able to go from 100 to 250 to 400. You said you hired people, which is very important because support quickly blows up. That's one thing I think people leave too late. I did it, and I know a lot of other entrepreneurs do it, but once you get that thing, that's so important like as soon as you feel the pain there, put someone in. You got those other people in there, and then how were you scaling it though? What was the main driver of all of the traffic? Was it ads? Was it organic? Robb Bailey:	It was a mixture of Facebook ads. We were using Facebook ads just like you teach to get people into our application funnel and book a strategy session with Ryan. It was that, and then also what started happening was we were getting good results for a lot of different franchise locations, so a lot of franchisees, and in the gym world there's a lot of people that ... It's very cliquey. If you're getting good results, word-of-mouth travels fast. If you're getting bad results, same thing. Robb Bailey:	I never saw any proof of this, but what I think happened was our name started to be flown around in some forums and things like that, and we were getting all kinds of different franchises starting to apply to our program. Well, one of them is 9Round, and in the fall, we were getting a couple of their locations some really good results. So the CEO of 9Round actually ended up calling us. Robb Bailey:	Ryan had a strategy session with him, and closed him on one of his corporate locations, but we started to nurture that relationship. He wanted us to basically help as many locations as we possibly could after he saw what kind of results we could get. He began to endorse us to all of his franchisees. That was part of the reason why we were getting a lot of warm traffic from just that one franchise. Robb Bailey:	But at the same time, we were just doing stuff like normal. I mean we were just getting independent gyms, small gyms, other franchises coming to us, but yeah. We scaled up our ad big time because we now had the capacity to fulfill on it. I'm not quite sure what our ad spend was the past couple months, but it was the most we had ever spent. I think it was 13 or 15 grand, something like that. Robb Bailey:	We get pretty good results from our campaign. I mean that's certainly not a lot to other people in your program. I know tons of people that have spent a lot more, but that was plenty of applications. Ryan was booked out for two, two and a half weeks solid at one point so we had to start filtering applications a little harder at that point, but we've always- Sam Ovens:	Sounds like he's going to become the new bottleneck. Robb Bailey:	He is. We started training one of our other guys to do sales because he said, "Yeah, I want to sell now." So that guy's getting on the phone- Sam Ovens:	I can already hear that that's the bottleneck now. That's the crux. Robb Bailey:	It is. Sam Ovens:	If one dude's doing all of this, you need to free that up. Robb Bailey:	Yeah, and what's crazy is we're still using the VSL funnel, and so it's time to also turn on the just-in-time webinar one and see how that performs. We got to build that and see if we can increase the quality and just filter a few more people out. Sam Ovens:	From what you've told me, you said he's closing almost all of the calls he has. Robb Bailey:	Yeah. There's days where he- Sam Ovens:	That means there probably isn't a quality issue. Robb Bailey:	There isn't, no, but- Sam Ovens:	So I wouldn't do that. Robb Bailey:	But what we're doing right now is manually filtering a lot of the people out. If we get somebody who applies and we just know we can't help them, then we won't even get on the phone with them. We'll just write them an email and say, "Because of these reasons- Sam Ovens:	It doesn't change with the JIT. Robb Bailey:	Oh. Okay. Sam Ovens:	You still get people who apply who aren't a good fit, and you still have to cancel them. You might get a little bit less, but that function still exists. What I'm saying is it's quite a lot of work to build out a JIT, test that, do that, and all of that, and it's not going to eliminate the problem that you're trying to use it to eliminate. Your time's better spent just finding more of your sales guys and then using what's already working. Robb Bailey:	Got it. Okay. Fair enough. Thank you. Sam Ovens:	And if this guy can teach the gyms how to do it, then surely, he can teach the other guys how to do it. Robb Bailey:	Oh, absolutely. Yeah. This particular team member used to work with him at the gym too, so he's already well trained. It'll be interesting to see how well he does. I think he's going to crush it. Sam Ovens:	Awesome. What's next for you? What's your vision for this thing? Where do you want to take it one year from now, five years from now? Robb Bailey:	Our goal this year was to do 500K a month every month, and the path that we see to doing that is helping probably two to three more franchises, just like we did with 9Round. There's a lot of different pathways to this. Abundance isn't an issue, and so at this time, we feel like that's the best way to do it. Robb Bailey:	We loved doing it the way that we did it where we help them with some core issues, show them results, and then got a good number of their network into our program because it allows us to specialize even further and help them solve specific issues in a group format. We loved it. We loved it. We loved doing it that way, so we want to help two or three more franchises this year in much the same way. Sam Ovens:	Got it. Do you have a big vision or some ideal that you're striving towards that's huge? Robb Bailey:	Yeah. What we want to do is actually make this system the go-to for all franchises and independents. In other words, we want this to be something that every gym has in their facility, and we're realistic. We know that every gym won't, but for the ones that want to survive, I mean the rates are staggering. 16 out of 17 gyms fail within the first five years. Those are the stats, and it's almost always because their sales and marketing is lackluster. Robb Bailey:	The average gym owner, especially the independents, they have a fantastic product. They know their stuff really well. They're very well-versed and getting their clients results and providing good experience and all that good stuff. The operational stuff they have down. What they don't have is this. Robb Bailey:	So we just want to help the people who want to stay open longer than five years and thrive and open multiple locations instead of closing in five years or less. Sam Ovens:	So basically, you want to empower the small fitness businesses. Robb Bailey:	Yeah, we want them to- Sam Ovens:	Give them the tools and systems and all of that. Robb Bailey:	Yeah. We want to empower the main street small business owner. Even though a lot of these folks are a part of a franchise, they're still [inaudible 00:56:27] they own one location. They have a family. A lot of these people have quit their job because they either started having kids or they didn't like their corporate job. They're chasing the American dream, and they have big goals, but they don't know how to get there. Robb Bailey:	For me, my dad was a small business owner, and he passed away flying helicopters because he was ... He basically was flying helicopters for the money because he couldn't make some of his other businesses work over a long period of time. This was like over 20 years, but to me, I just looked at that, and he was excellent at construction, I mean just an incredible craftsman, but he could not make the business side of it work. That's a much deeper story for me, but that's why I love helping small businesses. Robb Bailey:	All the men in my life growing up were small business owners, including my dad, but I had to ask myself the question, "Why couldn't he make it work if he was so good at what he did?" After he passed away, I became a little bit obsessed with that. That's what I see with all these gym owners is they've got a great product, but they're still buying the myth that, "If more people only knew about my business, then everything would be fine. People would just be throwing money at me." Robb Bailey:	That's not how it works, especially today. Our big goal is basically to give every gym in the country an opportunity to have our sales and marketing program. Much like they would go and sign up for a franchise, we want to basically have this be so good that it's a no-brainer to license it in every gym that wants it. That's our big goal. Sam Ovens:	Got it. You've gone from 20 grand a month to 400 grand a month, which is quite a jump. What would you say has been the one most transformative part of the training that you've been through and that journey? Robb Bailey:	The most transformative part. Gosh, there's a lot of them, man. I mean if I had to pick one thing, which I think is what you're asking, I think it's the mindset stuff. I remember I was in New York at your Mastermind, and you said, "Hey, I want everybody to go around and tell me what your goals are, your monthly revenue goals." Robb Bailey:	I started off, and I think I said, "100 grand a month," and I was the first one to go, and everybody else in the room went around, and I was by far the lowest number. As soon as the last person was done, I raised my hand again and said, "Can I change mine? I want to raise it." I didn't want to raise it because I wanted to be like everybody else, but I was literally probably the dumbest person in the room, and I certainly had the lowest goals of anybody in the room, which means my mindset was probably the smallest in the room, if that makes any sense. Robb Bailey:	So when I had first talked to you, you helped me believe that I could get to 50 grand a month, and then once I got to 50 grand a month, I believed that I could get to 100 grand a month. Then once I got there, I'm like, "Well, Sam's got people in his program doing 900 grand a month, $1 million a month. We can certainly get to 400, 500 grand a month," and then we did it. Robb Bailey:	It's hard to explain now, but before I even met you, I just could not have even dreamed that my business could be doing that much revenue. I just didn't think it was possible. I had no idea that it was even possible. So really, the mindset shift that happened when I entered the program and that continued to happen at various stages throughout it, was the biggest thing. The mindset stuff that you help with is probably the biggest impact thing that's ever happened to me in business, period, I think. Sam Ovens:	Awesome. I'm sure you've seen people in the community, the Facebook groups we've got, and you've seen the things that they struggle with and go through. What would your number one piece of advice be for them? Robb Bailey:	I guess my biggest piece of advice would be just to follow the system. Where you start to get stubborn and ignorant is when you think, "Oh, I'm just going to start off by cowboying my way through this and fly off and change a bunch of stuff." The more that I followed the system that you've laid out, the more leverage I got. Robb Bailey:	If there was one thing I wish I could have done different, it was I wish I would have focused a little more at the beginning. I'm happy where I'm at. I'm not complaining at all, but if I'd had more drive and focus at the beginning, I could have been having this interview with you maybe a year ago. You never know. Robb Bailey:	For years, I just thought I knew the best way, and that is not a good way to think as an entrepreneur because you don't know what you don't know. There's no possible way that I could understand the things that you know from a business perspective because you've already broken through several of those ceilings. I didn't understand that concept well when I first got into the program. Robb Bailey:	So my advice to people who are in the group and everything is just follow the system and work the system. Put in the work, and basically, have blinders on until you hit your initial goal, and then you can build on top of that. It's brick by brick. I skipped ahead a little bit. I'm not going to lie. I skipped ahead a little bit because I thought I knew what I didn't know, and that cost me several months of trial and error. So that's my best piece of advice. Robb Bailey:	You can always go back and improve things later, but if you just start off with the proper foundations, it's much easier to build a tall building, and that's what everybody I think you've seen have this level of success, that's what they've done at some point. Sam Ovens:	Yeah, they always get the foundations right. They love the thing, they're into it, they're solving a problem, and then, at some stage, differentiation comes. Awesome, man. Thanks for jumping on and sharing your story. I'm sure it's going to inspire a lot of existing members and probably inspire people to get into business too for themselves. Sam Ovens:	Now, we're going to put this on YouTube and stuff, so people might listen to this and be like, "Oh, I know of a guy who has a gym or a fitness studio or whatever." How do people find you? Robb Bailey:	If you own a gym and you want to apply to our program, just go to fitclubaccelerator.com. That's the name of our website. If you want to reach out to me on Facebook, my first name I spell with two Bs. It's R-O-B-B, and then my last name is Bailey. You're welcome to reach out, shoot me a message, and just reach out directly to us. I mean we're normal dudes. We respond to our messages and things like that, so just hit us up on Facebook, and we post all kinds of results and fun stuff about our business on our personal pages. Sam Ovens:	So those rumors aren't true then. Robb Bailey:	Which ones? The lizard rumors? Sam Ovens:	The lizard person ones. Robb Bailey:	So everybody, if you didn't know this, Sam is actually a lizard person. You can Google this and fact check it. It's totally true. He's been caught on camera flashing his lizard face and swinging his lizard tail. You should look that up, and you can see him next to all the other lizard people. Sam Ovens:	I'm not the one claiming to be a normal person. There's the true sign of a lizard. I'm totally normal, man. I'm totally normal." Robb Bailey:	Oh, it's so good, but anyway. Sam Ovens:	Cool, man. Well, thanks for chatting and looking forward to speaking soon and seeing the next level you get to. Robb Bailey:	Absolutely. Thanks for all your help, Sam. Appreciate you, man. Sam Ovens:	Cool. See you. Robb Bailey:	Bye.